We like to think that our decisions are based on logic and rational thinking but my guest today says that “everything we do is rooted in emotion”. Latest Neuroscience research is showing that our emotional brain plays a very important role in determining our thoughts and behaviors. It is also important that we understand how our emotional brain has the ability to override our rational brain and lead us to act more instinctively. 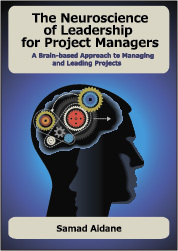 Continuing this series on leading projects with the brain in mind, today I have the great pleasure of speaking with Shari Frisinger on the role of our emotional brain in making decisions and collaborating with others. Shari Frisinger designs and conducts hands-on, real-world leadership workshops and executive one-on-one mentoring. Her expertise lies in increasing Emotional Intelligence and capitalizing on conflict resolution to create a high performing organizations. Some of her clients include Boeing, Chevron, Continental Airlines, General Dynamics, Johnson & Johnson, Enterprise-Rent-A-Car, Hawaiian Airlines, GE/Smiths Aerospace, Pepsico, Aramco. Shari is pursuing her Doctorate in Executive Leadership focusing on in-depth analysis and concentrated research into Emotional Intelligence and brain physiology. Shari is certified by Emotional Intelligence Learning Systems to administer, interpret and coach EI and is licensed to distribute and analyze social intelligence assessments. She is an adjunct professor at Mountain State University, teaching the core undergraduate courses in Organization Leadership. Tell us about the focus of your Doctorate in Executive Leadership research and consulting practice and how you got interested in both behaviors and the mental/emotional aspects of team work and leadership. You say that “everything we do is rooted in emotion”. What are some of the misconceptions we have about the role of emotions vs. rational thinking in problem solving and decision making? In your blog post “Just your ego peeking through”, you talk about how our Amy/Andy senses danger and gives us three options: fight, flight or freeze. Explain to us what you mean by Amy and Andy and how our brain reacts to threats. What proven techniques do you recommend we can use to leverage our emotional brain when leading our teams and collaborating with others? You are certified to administer EI assessment and you believe in the DiSC behavioral assessment. You have also been researching other assessments, learning styles and behavioral models. What motivated you to do this research and what conclusions have you drawn from your work so far? I truly enjoyed this podcast and learned many things I had not fully realized about myself. Thank you. Thank you so much for taking the time to comment. I am so glad you enjoyed the interview. We plan to publish more interviews looking at different aspects emotions from a neuroscience research perspective. Looking forward to bringing these insights to our community. Thank you again.